The Sinking of the H.M.S. Tara (previously named the S.S. Hibernia) by a torpedo from a German U-Boat - U35 - off Tripoli. The S.S. Hibernia was built by Denny Brothers of Dumbarton on behalf of the London & North Western Railway Company. Launched on the 22nd of December 1899, she was put into service on the 12th January 1900 as an express passenger steamer on the Irish Sea passage between Holyhead and North Wall Dublin. She grossed 1862 tons, was made of steel, and had twin screw propellers. 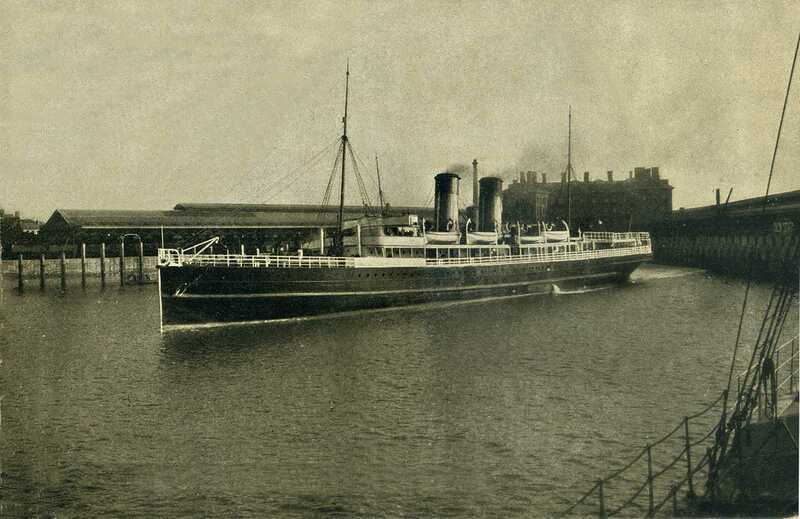 When the Holyhead to Kingstown (later Dun Laoghaire) service was restored due to increasing dock dues at North Wall, the Hibernia sailed on that route with the other three express steamers - Cambria, Scotia, and the ill-fated Anglia. Following the outbreak of World War One (WWI 1914-1918) she was commandeered by the Admiralty, refitted for patrol service, and renamed HMS Tara. Her first years war service as an auxiliary patrol boat saw her patrolling the shores of Ireland and Scotland, and she was then moved on to patrol duties in the Mediterranean, patrolling the seas around the Egyptian coast. On the 5th November 1915, with a crew of 104, HMS Tara was heading for the port of Sollum, an Egyptian port on the border of Egypt and Tripoli. Look-outs screamed the report of an inbound torpedo, but HMS Tara was travelling too slowly to respond in time. The guns of HMS Tara opened fire, but the sub was too far away. She was struck by a torpedo on the starboard side of the engine at 10 minutes after 10 in the morning, and within minutes she was sinking. In the 7 or 8 minutes it would take her to sink, her mostly Anglesey crew had taken to the remaining 3 lifeboats - a fourth having been blown away in the explosion. They pulled men from the water, and eventually 93 survivors filled the 3 lifeboats. The submarine that had sunk HMS Tara - U35 - now fully surfaced and flying the German flag, took the lifeboats in tow, making some of the survivors cling to the deck of the submarine, and landed them ashore 8 miles away at Port Suliman, 20 miles west of Sullom. On the way they pulled from the water the dead body of a cook named Jackson. The survivors were given water and biscuits by the crew of the U-boat and handed over to the Turkish authorities and several Senussi soldiers. They buried the cook, Captain Tanner giving a service, and a small cross was erected. With many of the men bare footed, they were marched through the desert and over mountains, and fed little more than bread, biscuits and a little goat meat. One of the men whose name was William Thomas, the quartermaster, had smashed his leg trying to rescue a colleague. His leg was so bad that an amputation with just a pair of scissors was attempted, but unsurprisingly he died at 11:30pm on Sunday November 14th. His burial service was at 8:30am the next morning, and the service was given by Captain Tanner. Most of the survivors wept as they sang the hymn ''I pitch my tent a days march nearer home''. At night they slept in caves, often with lizards and scorpions for company, singing Welsh & English hymns to comfort themselves. At first they had no blankets, and the nights were bitterly cold. Later half of the men were given blankets, and the crew huddled together for warmth. Water is scarce, and even when there is some it is dirty and brackish, so the men were to suffer from dysentry for many months. On the morning of November 15th they were marched for four hours to the sea shore, where they were joined by survivors of another boat - HMS Moorina - also sunk by the U boats. One of them had a 1/2 pound tin of tobacco, which he shared out, much to everyone's pleasure. Goat meat was again supplied, but the guards stole some of it during the night. At this time they were under the control of a deserter from the Egyptian Coastguard by the name of Ahmet Effendi. They were given meals that consisted mainly of boiled rice and goat, and by now their tongues and the roofs of their mouths were peeling. At 5am on the 16th of November they began marching again, and after about two hours they came across a caravan of about 12 camels. They rested and were fed before they again started marching, noticing a steamer passing some distance out to sea. At midnight they arrived somewhere with a few buildings, and slept outside on the ground. By the morning of the 17th they were cold and hungry, and grateful for a meal of goat. There was more than the usual amount of water, and was even enough to take their first wash since they had arrived. By 3pm they again marched, until it became obvious that they were lost. They came upon an Arab village and were given a place to rest in tents. The morning of the 18th they awoke to the gazes of the villagers, who had probably never seen white men before. They were given a meal of boiled rice and water before they again began marching. They marched through the desert until 10pm, were given some green tea, and went off to sleep on the flat barren land, out in the open. The day of the 19th was much like the previous day, marching for hours and hours until, hungry and exhausted, they again ate a little and slept on the hard ground whereon they found themselves. On the morning of the 20th it was found that one of the survivors - a fireman named Thomas Owen - had escaped. The guards were furious. They threatened to give them no food, and indeed for the remainder of the day the only thing they got whilst marching for 10 hours was a drink of water. Tired and very hungry they again slept on the hard ground out in the open. On the morning of the 21st after a night of starvation and of poor sleep, caused by their blankets being wet, they continued marching. They marched until 7pm, during which time many of the men had passed out and had to be carried by camel. They were fed a little rice, and to a man they fell asleep absolutely exhausted. The following day after a drink they marched for about four hours, when they stopped to rest besides some disused wells. Some of the men - having seen some snails - had the idea of roasting some to eat. Many of the men enjoyed this welcome addition to their usual diet of just boiled rice. They fell asleep in the open. After another miserable nights sleep with the blankets soaked by the dew, they were removed to a well about a mile away, where they were able to wash themselves - their third wash since they had arrived. The days of the 24th and the 25th were much of the same, waking up wet, marching, starving, feeling tired, and eventually stopping to sleep. On the morning of the 26th of November 1915 they were awoken at 4am and marched until 11am. The place was Bir el Hakim, 250 miles from where their ordeal had began. Here they were told, was where they would see out the rest of the war. The place that they had been brought to was in stark contrast to the one they had been promised, where fig and date trees were in abundance, and so close to the sea as to be able to fish for their meals. It was a barren place with a 2 block house and 2 wells, one of which was empty. The other was in the charge of a priest and his 3 wives. Each man was given a ration of ¾ pound of rice and ½ pound of flour. Morale was low, and everyone was hungry, and the wind blew a cold wind amongst them. Once again, they slept out in the open. The next day - Sunday, November the 28th - they were given what was left of an old Arab tent, which they erected whilst a working party went a couple of miles away to collect whelks. The tent was where the officers would sleep, whilst the men slept in an old well. After a Sunday service, and some hymn singing in Welsh & English, everyone was asleep by 6pm. It was bitterly cold, and one blanket was shared by every 2 men. Without matches the only fire was one lit from the embers of the previous days fire. On the 29th they dried out the little tea that they were given, and smoked it instead of tobacco. They were told that the area had seen no rain in 3 years, and that they expected heavy rain between December & February. They hoped that this was not the case as they would have to sleep in it. On the 30th several working parties were organised, one to collect fire wood from a distance of three miles away. Another collected stones to build some kind of a hut for the officers and men. Four messes were set up in tents, and each mess given some cooking utensils, and each man given a spoon on which their name was engraved using a pen-knife. December 1st and the 2nd - the 28th & 29th days in captivity were much the same as above, with the days warm and the nights cold, and waking up with their blankets wet with dew. They were given no news of home or the war. On the 4th December they were given a sheep that had been killed by a wolf. It was not much to share between them all, but nevertheless a very welcome addition to their rice diet. They prayed that the wolf would be busy every night. It was Sunday the 5th of December and a church service was held, during which time they sang ''God save the King''. They were warned by the Turkish officer that if they sang it again church services would no longer be allowed. That night 2 shots rang out, and in the morning the body of a dead wolf was found. In the morning it was discovered that a young camel had drowned in the well, and it was skinned, cut up, and the meat shared out. For tea they boiled its head with some rice, and for supper they ate its liver, kidney and heart. By December the 7th the camel was all but eaten, the teeth were kept as curios, and the skin was dried in the sun, for they were to attempt to make shoes out of it. The men are become more industrious, and some even make clothing from the sacks that once held the rice and flour rations. Clothes are in short supply, and a needle is made from a piece of bone, and thread from an old sail is utilised to mend and make garments. Dysentry is raging amongst them, and even though there is a doctor, he seems powerless to help without medicine of any kind. On the 15th of December the Turkish officer and his men left for Sollum promising that they would return with chickens and eggs for Christmas. The survivors are left solely in control of the Senussi soldiers. On December the 19th Thomas Owen, who had previously escaped, was brought into the camp under armed guard. After getting struck in the face, he was actually given a little to eat and allowed to join his friends. It turned out he had actually been treated extremely well.........considering. Food is getting very scarce, and a search for snails reaped a harvest of about 700, which they boiled and ate. Christmas Day was a Sunday, and many of the men are so sick with dysentery and hunger that they are totally incapacitated. A few days before, a Turkish officer had travelled through, and he promised to send supplies and medicine. The men weren't holding their breath. They drank a little tea, sweetened with sugar that had been kept especially for the day. Some flour and water had been mixed, and boiled in a cloth bag for several hours. This made a pudding that was most acceptable to the hungry men. Later, the men that were able sang carols around the camp fire. After the men had settled down to sleep a messenger arrived, and told one of the priest's wives that her brother had been killed by the advancing British troops. The Turks had told the messenger that the British were advancing, almost without resistance, and would soon be in Alexandria. On the 26th of December heavy artillery is heard all afternoon in the distance, and it is assumed that it is British warships opening fire on Sollum, in preparation for more landings. The next few days are more of the same with the men hoping that they might be home for the new year. Meagre rations are handed out, and morale is even lower than usual. On the evening of 5th of January a boilermaker named Cox died. The next morning, using the lids of cooking pots, they were able to dig a grave 2 or 3 feet deep, and Cox was buried. As many of the men as could walk attended, and Captain Tanner read a service, or as much as he could remember. They sang ''One days march nearer home'', ''Abide with me'', and a Welsh Hymn. On Tuesday the 8th of December another burial took place, a man named Hodgson. His friends placed his body in some old bags, which they sewed up and buried him in. More hymns were sung in both English and in Welsh. H.O. Hughes, a fireman, who was a deacon in a chapel at Holyhead, read a prayer in Welsh, which reduced many of the men to tears. After the service the grave was covered with stones in the shape of a cross, equally in an effort to avoid the attentions of wolves. Thus was life in captivity for the survivors of the two ships, until March the 17th 1916, when without warning they were rescued by a British convoy headed by the Duke of Westminster. Hearing of their plight they had made a 120 mile dash across hostile territory to rescue them. The survivors were taken to Alexandria for hospital treatment, and allowed to recuperate before they were returned home to a heroes welcome. They had been in captivity for 135 days and 135 cold, wet, and hungry nights.